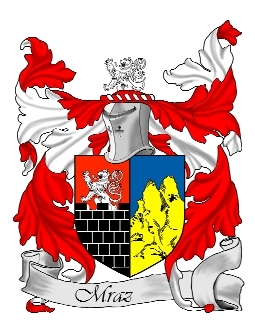 The arms is as follows: "Gespalten, vorne in roth silberner, aus schwaz, silbern gefugter zinnenmduer wachsender lowe: hinten inblau schroffer, geklufteter galdener felsen." Translation/Interpretation: "Split, in the front red silver, out black, silver jointed battlement wall lion waxing, behind in blue, golden rugged clefts and rocks." The full heraldic arms description is: "Per pale, the dexter per fesse embattled argent and sable, the base masoned argent, and issuant from the battlements, a demi lion rampant azure, langued and armed gules; the sinister azure, a mountain issuant from base or." Divided in two vertically, (the left half more important of the two), the right divided in two horizontally in silver and black, the base masoned (bricked) as a battlement; from that a half silver lion rising with fore paws in the air, tongue and claws red; the left blue, with a gold mountain. These are my original versions of the two coats from the two sources I have. Based on my translation of the description from Halbert's, I think they misinterpreted it, and the image on the top is the correct one If you click on these, you will be able to see the medium sized versions (my original source graphics are 4x as big as those linked here). The description sources for each version are listed below the image. The two versions shown are based on two different descriptions from different sources. They pretty much agree, but the two sources disagree on color. The respective description of the arms is linked below each image. The image that was previously on my homepage is an earlier original I did when I first started is still available here. A search on another site produced information on the "Mraz's of Poland" (should not be confused with us, since I KNOW my grandfather's parents came from Croatia): "MRAZ Shield: Red background with a silver breast plate. MRAZ Crest: Feathers out of crown."